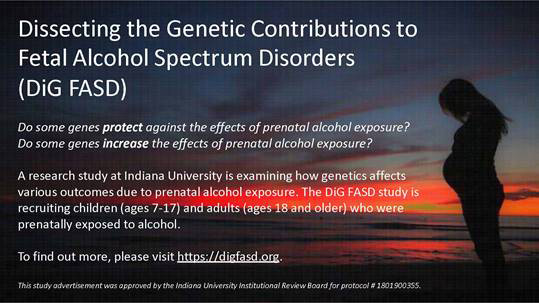 The Collaborative Initiative on FASD (CIFASD) has launched a research study to investigate how genetics affects various outcomes due to prenatal alcohol exposure (PAE). The study, led by Dr. Tatiana Foroud at Indiana University, is enrolling people with PAE ages 7 or older. Everything is done online and participants provide facial photographs and a saliva sample. Please go to https://digfasd.org or contact us at [email protected] or 1-844-378-0002 (toll-free) for more information.